Conrad Evarts is about as archetypal a hunter as you could find. A western Montana resident in his early 40s, Evarts grew up hunting deer and elk, and can still usually be spotted wearing camouflage or flannel clothing. As a producer and videographer, Evarts says he’s been to Africa “more times than I can remember,” with visits to South Africa, Tanzania, Zimbabwe, and Mozambique. So he has definitely been following the situation involving the death of “Cecil,” a well-known lion in Zimbabwe, at the hands of an American dentist. In an interview, Evarts declined to address the Cecil situation explicitly, saying he did not want to attach his name directly to what has become such a sensitive topic in the U.S. But he did offer an explanation why the now-infamous dentist, Walter Palmer, would have been hunting in Africa in the first place. “Evolution,” he said. “You’re here because your ancestors were adept at hunting. I’m here because my ancestors were adept at hunting. For three million years, since we came out of the trees, we’ve been hunting." For hunters like Evarts, shooting big game in Africa represents one of the purest expressions of these primordial feelings. Palmer reportedly paid $50,000 to kill Cecil the lion. But Evarts rejects the notion that most American hunters in Africa are rich guys coming to blast away zoo animals. But even when they are the hunters are usually respectful of ethical hunting practices. Palmer has yet to be charged with committing a crime. “The idea that by definition, because of their prosperous background, they’re just blowing these animals away — that’s not been my experience,” he said. “I’ve traveled to Africa with CEOs, intelligent, successful, prosperous people…regardless of what socioeconomic stratum they were in, they were remarkably respectful of the game." Evarts disfavors calling the act of hunting “sport,” and he is bothered by those who brag about their kills in public, especially on social media. Evarts and his daughter, now a teenager, in Texas. Evarts argued that hunting in Africa actually helps protect animals from poachers. As long as hunters are supporting a local economy through hunting concessions, the incentive for the local economy tips toward preserving and breeding (or allowing the breeding of) game, so that hunts can continue. He cited the example of the Cape Buffalo in Mozambique. Prior to the advent of hunting in their territory, there were fewer than 2,000 buffalo left. But since licensed hunting came into effect, their population has exploded. “‘Anti-hunters like you to believe we’re all psychopaths,” he said. “They want to blur the line between poacher and hunter, but I have far more disdain for a poacher than the average person." Though Evarts wouldn't directly comment on the Cecil incident, he indicated that the scandal could further tarnish hunters’ reputations. 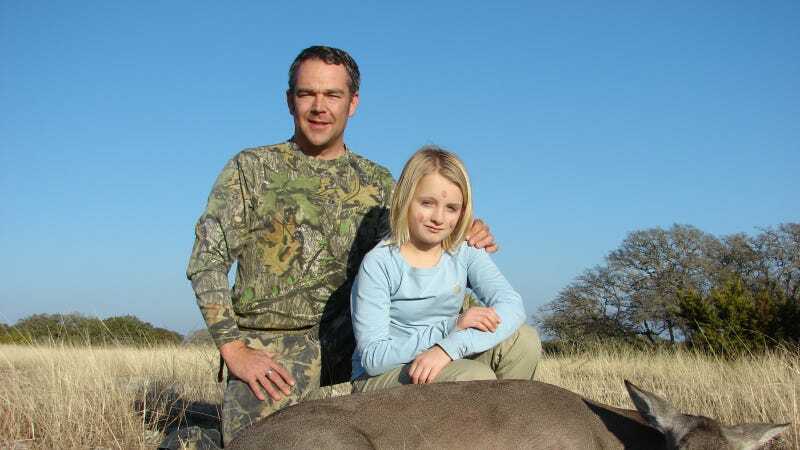 If that happens, he said, his daughter won’t have the same opportunities to hunt that he did.